Since purchasing my Nutri Ninja blender I have loved making smoothies and experimenting with new recipes! However, with a busy lifestyle and trying to cram work, gym, socialising, eating (very important) and catching up on the blog all into one day my beloved fruity treat often gets forgotten. I rarely set aside the time to chop up fresh fruit and veg, or if I buy a big bag of spinach with every aim of being a healthy green goddess it usually just ends up wilting in the fridge. 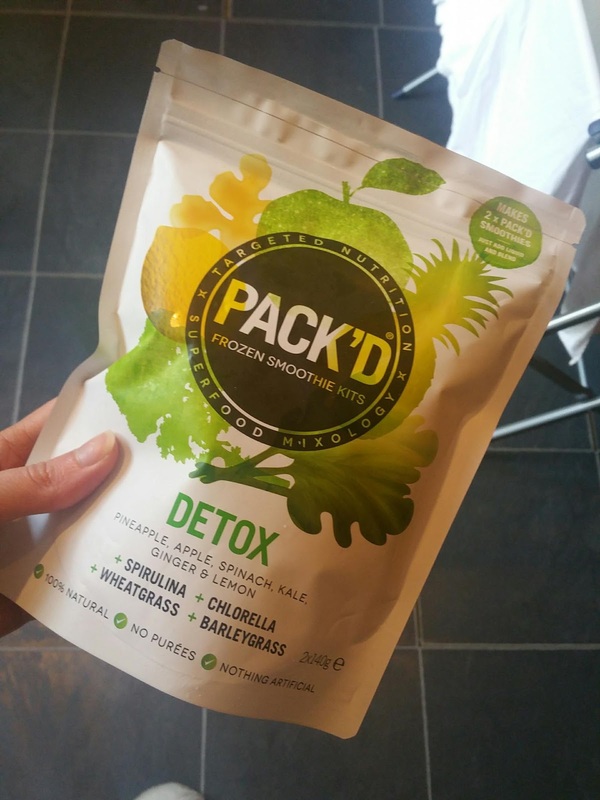 Fortunately the PACK'D Smoothie Kits make stocking up on your fruit, veg and additional health supplements much quicker and easier. Each pack contains two frozen fruit & vegetable pouches and two superfood mixes. Just add your liquid of choice (you can add coconut water, almond milk or just good old water out the tap! ), blend, and it's ready to go! Energy - Contains stawberry, blueberry, banana, raspberry, blackcurrant and spinach. Superfood mix of flax seed, maca, cacao, guarana. Detox - Contains pineapple, apple, spinach, kale, ginger and lemon. Superfood mix of spirulina, chlorella, whatgrass, barleygrass. Defence - Contains pineapple, mango, papaya, banana, ginger & goji berries. Superfood mix of flax seed, pumpkin seed, sunflower seed, baobab. I tried out all three and have to say that Energy is my favourite - it tastes the fruitiest and sweetest! Detox is a great green smoothie to help with cleansing and Defence makes a good pick me up if you are feeling run down. The ginger adds a bit of a kick though which I wasn't overly keen on. The great thing about PACK'D kits is you can just pop them in the freezer without worrying about fruit going off, and they are ready whenever you want them. You don't need to buy a variety of different fruit and vegetables as everything you need is just in one sachet. I also love the added superfood mixes as it can be quite costly to stock up on large bags of seeds and supplements. Plus, you don't just have to restrict the superfood mixes to smoothies - you can add them to porridge, yoghurts, on top of fruit and granola - whatever you like! Having a smoothie each morning helps to fill me up on my journey to work to stop me craving snacks throughout the day and makes me feel more energised. Now with PACK'D I can enjoy them more often without any hassle or fuss! Kits cost £3.50 (containing two servings) and are available in Sainsbury's, Tesco, Planet Organic and Whole Foods! These sound amazing! I love starting my day off with a good smoothie, but my new job means getting up super early and I just can't take the time out in the morning before work to make one from scratch - this sounds like the perfect replacement.